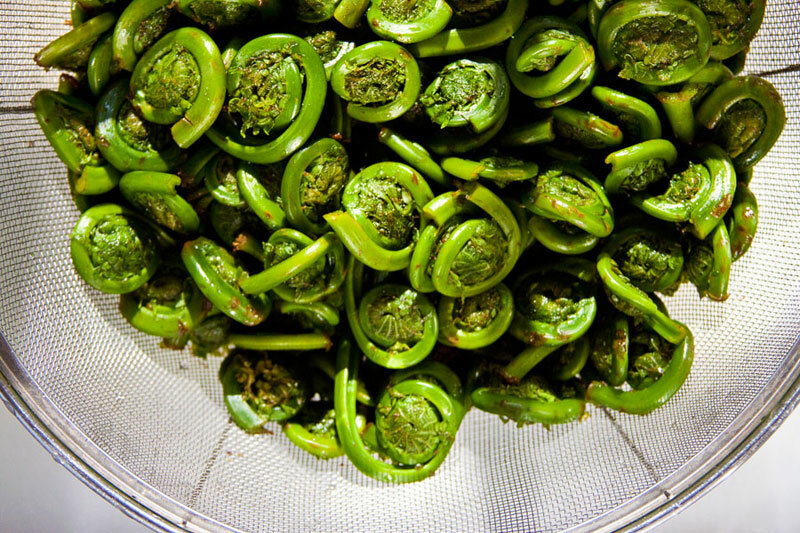 Fiddleheads are among the first wild delicacies to emerge each spring, slowly raising their tightly furled heads when the sun first begins to warm the soil of lowland forests, from the Great Lakes to the Maritime Provinces of Canada. Named for their resemblance to the carved end of a violin, fiddleheads have a deliciously intense flavor which has been compared to artichokes, green beans or asparagus, but which has a nutty, mossy quality uniquely its own. 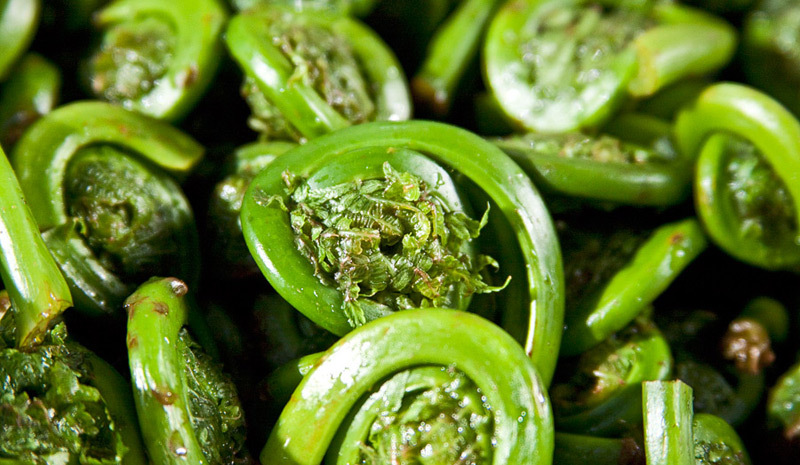 No other vegetable, cultivated or wild, matches the exquisite form and subtle flavor of fresh fiddleheads. Fiddlehead ferns remain one of spring’s most elusive wild offerings. The season lasts for a few short weeks each spring, beginning in late April or early May and running until mid-June. While there are several varieties of edible ferns, we prefer Eastern fiddleheads, specifically the Ostrich Fern (Matteucia struthiopteris). Yes, there are other varieties of edible ferns that appear earlier in the season, but frankly, we just don’t like them very much – and neither do most of our fern-loving friends. 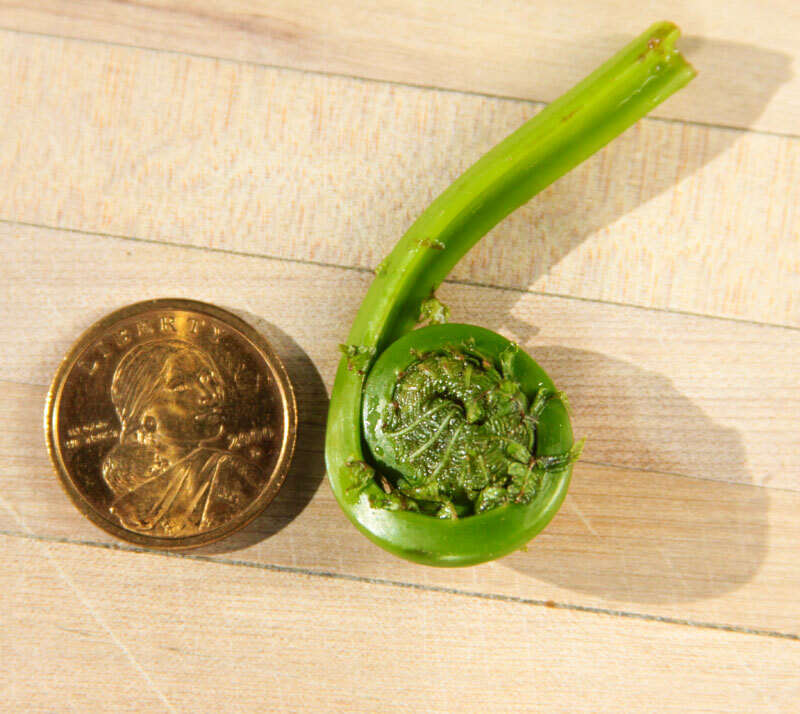 Fresh fiddleheads should be tightly coiled with only an inch or two of stem extending beyond the coil. Just-picked fiddleheads may still bear the brown papery chaff that surrounds the coiled head on the plant. While much of this chaff may have been removed before you get them, some may remain, but it’s easily removed. The outside of the coil displays an intricate pattern of tiny leaves along the sides of the spiral. The furled coil is typically about the size of a quarter or a little larger. Larger fiddleheads are acceptable as long as they remain tightly coiled. You may note that common bracken and other ferns also produce tightly coiled new growth in the spring, but beware – not every variety of fern is suitable for eating. If more than 2 inches of stem remains attached beyond the coiled part of the fiddlehead, snap or cut it off. If any of the paper chaff remains, rubbing by hand or vigorous rinsing should remove it. Rinse the fiddleheads thoroughly in cold water to remove any dirt or forest debris and drain well. Fresh Fiddleheads store quite well. Keep them refrigerated for up to 10 days, although their flavor is best when they are used as soon as possible after harvest. Fiddleheads should always be cooked before they are eaten. First, rinse the fiddleheads well in cold water to remove any remnants of the brown papery chaff and trim the ends if desired. Bring a large pot of salted water to a rolling boil. Blanch the fiddleheads by placing them in the boiling water. Allow water to return to a rolling boil. Remove from heat immediately, drain and quickly plunge them into an ice water bath. Drain again. Your fiddleheads are now ready to use. Marinate them, saute them, use them in soups, put them on salads – serve them any way you please. I’ve been hearing so much about fiddleheads lately, of course it’s probably because ’tis the season! Thanks for all this great info, hope I get a chance to try them!